Ebony Camera is not exactly a household name in the photographic community, or in the mainstream of camera manufacturing for that matter. 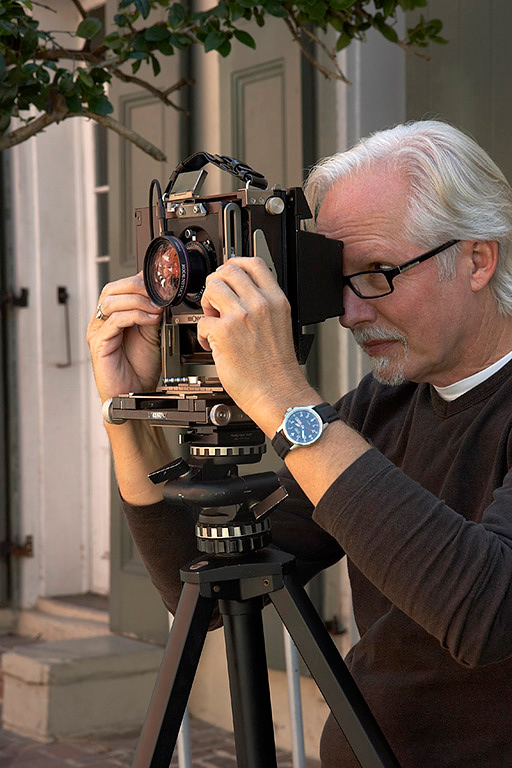 But for those photographers who have used, or even seen, an Ebony View Camera, with its meticulous handmade construction of macassar ebony wood, titanium, and leather, is a camera and visual experience you never forget. Jeff Taugner at Badger Graphic Sales, the largest Ebony reseller in the United States, put it definitively and succinctly during a recent phone conversation, “Ebony is the finest wooden field camera ever made and, honestly, nothing else is even close.” After June 30, 2016, Ebony Camera will cease manufacturing their iconic cameras. Final orders have been pouring in since the news went public that June 15, 2016, would be the cut off date for orders for new cameras. Ebony will spend the next few months fulfilling orders, and these will be the last cameras delivered world wide. The good news for Ebony users is that parts and service will continue to be available for the foreseeable future. Nonetheless, this is a telling moment for large format, film-based photography. 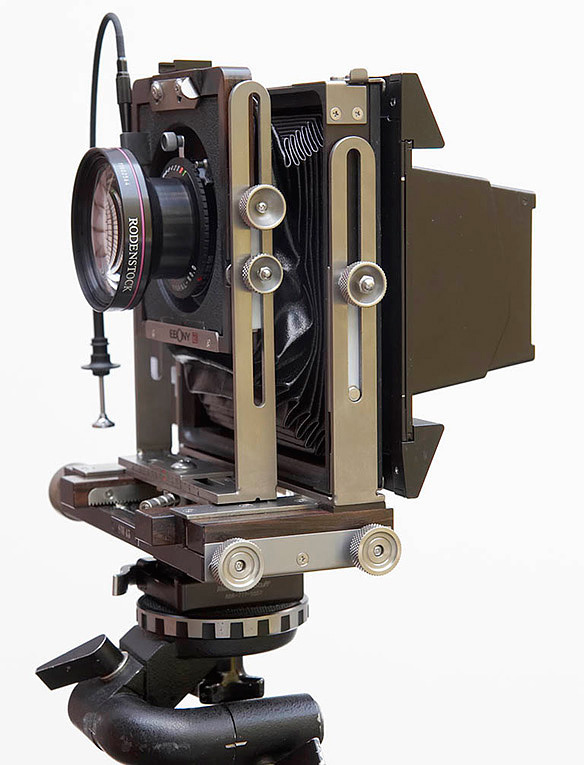 The Ebony 45SU is a great example of the functional beauty and innovative design for which Ebony Camera is known. No compact, wooden field camera before it featured the extreme movements it possessed. It has adequate extension for longer lenses and easily accommodates extreme wide angles. Ebony Camera was never about mass production. The Ebony workshop in Tokyo currently employs only seven people, who construct, by hand, the ebony or mahogany wooden components. They also manufacture the titanium parts in a shop nearby. 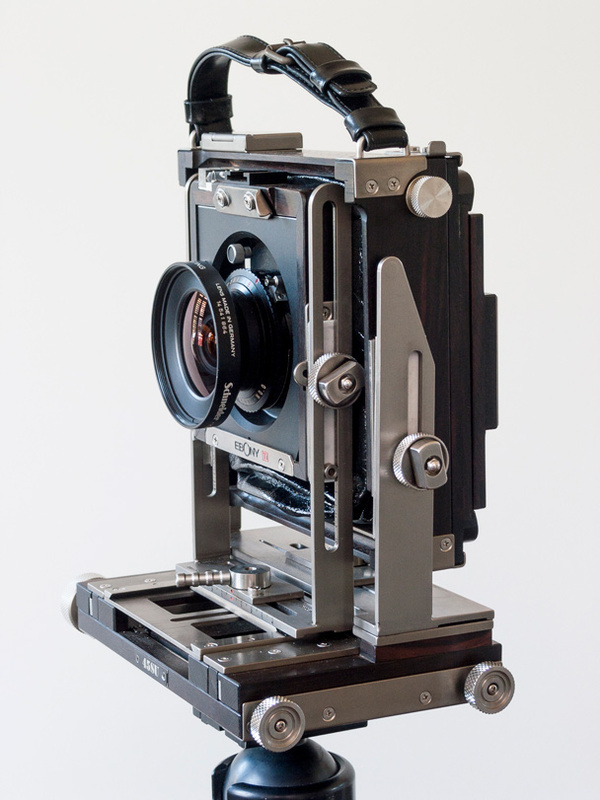 The leather bellows and the lacquer finish on the mahogany cameras are outsourced. Such a small operation would probably never have achieved worldwide distribution were it not for the internet and the small cadre of Ebony resellers who believed in these cameras for their strikingly innovative design and jewel-like construction. Lens and Repro in Manhattan (also history, sadly) began selling Ebony cameras in the early 90s in the U. S., but in that era long before the internet, it was difficult to sell a camera no one had heard of, which didn’t advertise in any of the photography magazines of the day, and for which there was no printed product catalog or user manual. It was a short lived experiment that failed. But, by the late 90s, Ebony had a comprehensive web site, an international sales representative in Ian Wilson, and Badger Graphic Sales was on board as a reseller. The result was quite different now and their view cameras quickly developed a loyal following. I purchased an Ebony 45SU from Badger in 1998 and quickly fell in love with this camera like no other camera since the Leica M4 I bought in 1973. The 45SU was a tour de force of innovation. It was extremely compact, though it didn’t even fold, as all wooden field cameras are supposed to do. It had asymmetrical movements, a superb wide angle bellows (as an accessory), an extremely versatile accordion bellows, the brightest fresnel focusing screen I ever used, and a wide array of clever accessories that made large format photography a true pleasure. 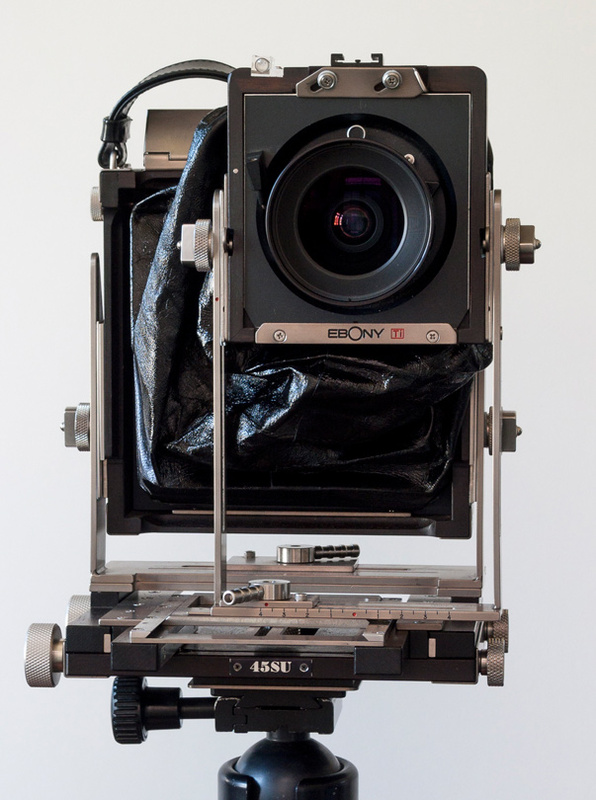 Ebony was the brainchild of Hiromi Sakanashi, a large format photographer originally from the southern island of Kyushu where his family had opened one of Japan’s first camera stores in 1872. Hiromi wanted a large format camera that was light and portable and could find none he really liked, so he decided to make his own. And he did a masterful job of it. His camera was admired by fellow Japanese photographers and he agreed to make cameras for them. Before he knew it, he was in the large format camera manufacturing business. As the reputation of his cameras grew, so did the realm of photographers who purchased them. Wolfgang Volz, who documented the conceptual artist Christo’s works, used an Ebony, as did Nick Nixon and Max Aguilar-Hellweg. Nick Ut bought one for personal work. Robert Polidori used an Ebony 11×14 camera (among others). Noted Japanese photographers Taishi Hirokawa and Kazutoshi Yoshimura were Ebony users, as was the English photographer Joe Cornish. Ebony’s web site features a gallery page of user photographs, which can be viewed here . Shortly after I purchased my 45SU, Ian Wilson asked me if I would be willing to serve in an informal capacity as a professional spokesperson for Ebony in the U.S. Jeff Taugner had recommended me as a good candidate. This was 2000, and very few large format photographers had ever seen an Ebony camera in the flesh. Distribution was narrow, advertising non-existent, and there weren’t catalogs or manuals. But their web site was attracting a lot of attention. I committed to answer user questions in an unbiased, third party kind of way, for any photographer who was interested in knowing more about Ebony. I responded to lots of emails and a few phone calls over the years, went on to write a couple user manuals, including the most elaborate one, which covered the use of asymmetrical movements for all cameras with this feature. As digital capture came to dominate the photographic landscape I worked with Ebony on the modification of the Phase One flexadapter so that an MF back could be used with Ebony cameras. Ebony’s adaptation was flawless, but the experiment ultimately was compromised by limitations with MF digital technology. The lack of live view with CCD sensors was the primary issue. The tiny 645 format (by large format film standards) was the other. Fortunately MF is moving toward CMOS and live view. Hiromi’s swan song of view camera design are the Finesse models, which are designed for digital capture. These models feature new standards, which allow for very short extension and ball screw or rack and pinion drives for precise movements. 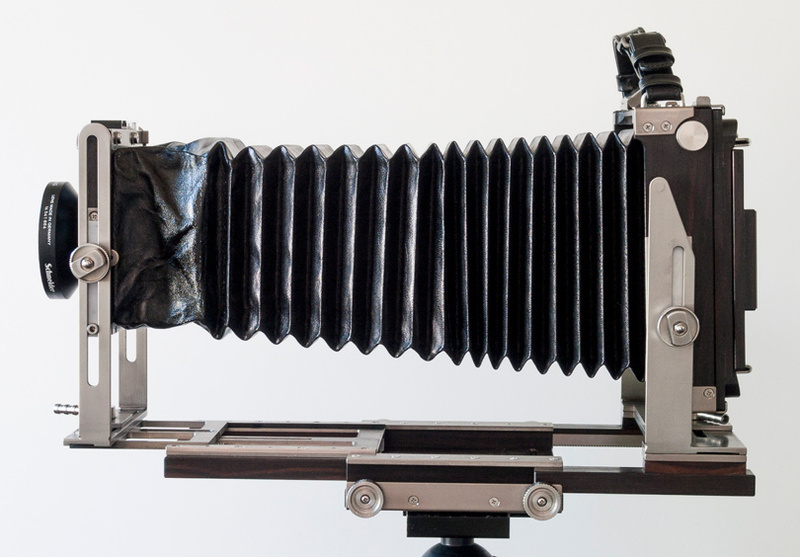 The reason for the Ebony closure is not entirely due to the waning of large format photography. Hiromi, who personally inspects and approves every camera manufactured, is now 73 and cannot go on forever. But, changes within the industry have made an undeniable impact. Ebony is part of a familiar pattern. Schneider and Rodenstock no longer manufacture lenses for large format film photography, only digital capture on 645 format, or smaller. Nikkor and Fuji no longer manufacture view camera lenses of any type. The only lenses currently manufactured are by Cooke Optics. The offerings are very limited and the prices high. Copal, the last manufacturer of mechanical shutters for view camera lenses, is history. Fidelity and Lisco no longer make film holders. Toyo is the last manufacturer of plastic film holders. All others are handmade wooden holders and expensive. Polaroid, whose instant films were used pervasively for proofing with large format, is long gone. Attempts by small upstart companies to manufacture their products have produced finicky and ludicrously expensive offerings to date. Fuji just announced this year the discontinuation of all their peel apart instant films, which were the only affordable option until now. The hand writing is on the wall. The era of large format film photography, as we have known it for the last half century plus, is coming to an end. The closure of Ebony, which made the finest and one of the most extensive lines of wooden view camera models, is merely the latest evidence of the trend. I do believe, however, there will be a resurrection on the horizon and it may not be too many years away. Fortunately, there is a substantial used inventory of view cameras and lenses out there. The equipment is exceedingly simple by digital standards, lasts forever, and when repairs are needed they can frequently be made by the user. For more complicated issues like overhauling shutters and fabrication of parts no longer made, there are photographic machinists, such as S. K. Grimes. So, current, die hard, practitioners will be able to carry on and a cult following for large format photography will emerge in the future inspired by the extraordinary work created with these tools. Trust me, this proven method of image making may be rare in future, but it will not become extinct. Thanks to Jeff Taugner of Badger Graphic Sales and to Ian Wilson, former international sales representative for Ebony Camera, for providing information used in this article.